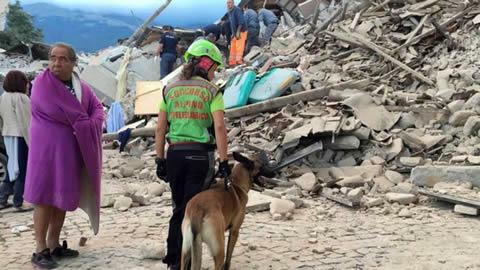 Rescuers and residents search for victims among damaged buildings after a strong earthquake hit Amatrice. ROME—A 6.2-magnitude earthquake struck central Italy early Wednesday, killing at least 21 people and leaving many trapped beneath the rubble of buildings that collapsed while they slept. Local officials in the areas struck by the quake said that 21 people have been confirmed dead so far, with many more wounded or missing. The quake hit at 3:36 a.m. local time and was felt across most of central Italy, including in the capital, Rome, sending people running into the streets. VATICAN CITY, Aug 24 (Reuters) - Pope Francis, saddened by an earthquake that struck central Italy overnight, on Wednesday cancelled a speech he was to have given at his general audience and instead prayed with the crowd for victims and survivors. "Hearing the mayor of Amatrice say that the town no longer exists and hearing that there are children among the victims, I am deeply saddened," he told tens of thousands of people who had gathered in St. Peter's Square for his general audience. 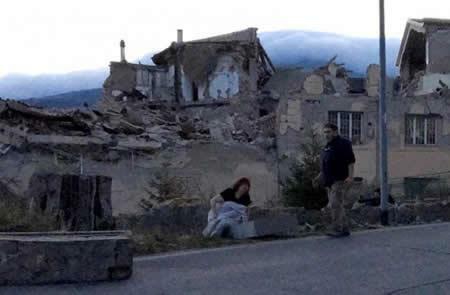 Amatrice was one of the mountain towns hit by the quake. At least 20 people were believed to have died in the disaster, with many dozens still missing. Francis said he would postpone his weekly address on religious teachings until next week and asked the crowd to pray with him for the victims of the quake. CNN- 24 AUG. 2016 - A strong earthquake hit central Italy, leaving terrified residents huddled outside collapsed buildings and others trapped beneath the rubble. At least 14 people died following the 6.2-magnitude earthquake early Wednesday, according to CNN affiliate Rai. In Amatrice, buildings collapsed and left the mountainous town in ruins. "The town is no more," Mayor Sergio Pirozzi told the affiliate. "I have an appeal to make: we have access roads to the town cut off and people under the rubble, help us." "We don't have any more light (electricity) and it is urgent to clear the access roads," he said. Tommaso della Longa, a spokesman for the Red Cross, said the images coming out of Amatrice are grim. "The picture we got from our delegate in Amatrice are telling us a terrible story of a small city almost completely destroyed," he said. "The situation is difficult at the moment." The priority is to find survivors, he said. "These areas are in central Italy and are in middle of mountains and valleys," he said. "There are small houses in the middle of the valley that are completely alone and they need help. It'll take some time to reach them." Independent- 24 Aug. 2016- .A magnitude 6.2 earthquake has hit central Italy, causing extensive damage to a number of towns and killed at least six people. "The town isn't here anymore," said the mayor of Amatrice in Rieti, believed to be one of the worst-hit areas, and where residents are buried under the debris of collapsed buildings. The death toll from the quake, which struck near the Umbrian town of Norcia and sent out tremors that could be felt in Rome, is expected to rise. The worst hit towns were believed to be Accumoli, Amatrice, Posta and Arquata del Tronto, spokesman for the Italian fire department Luca Cari told Reuters. Helicopters would be sent up at first light to assess the damage, he said. 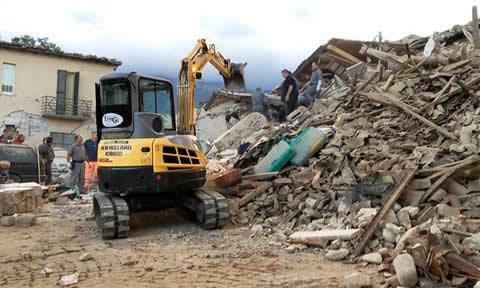 Mayor Sergio Pirozzi told state-run RAI radio and Sky TG24 that he needs heavy equipment to clear rubble-clogged streets to get to the injured in Amatrice. "There are people under the rubble... There's been a landslide and a bridge might collapse," he said. Asked if there were any dead, he said: "Look there are houses that aren't here anymore. I hope we get some help." The quake struck shortly after 3.30am local time, and was followed by several aftershocks. One, around an hour later, was recorded as magnitude 5.5 by the US Geological Survey.  The mayor of Accumoli said a number of buildings had been badly damaged. “Four people are under the rubble, but they are not showing any sign of life. Two parents and two children,” Mayor Stefano Petrucci told RAI television. RAI quoted police as saying two people were known to have died in the nearby village of Pescara del Tronto. The earthquake hit a relatively sparsely populated area on the border between three regions - Umbria, Lazio and Marche, causing damage in all three. Norcia, around 10km from the epicentre, has a picturesque historic centre and is a popular tourist site. Mayor Nicola Alemanno said no deaths have been reported deaths in Norcia. 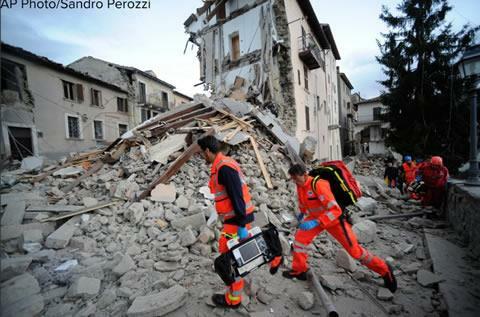 Prime Minister Matteo Renzi's office said rescue teams were being sent to the worst-hit areas. Italy's civil protection agency said the earthquake was “severe”. “It was so strong. It seemed the bed was walking across the room by itself with us on it,” Lina Mercantini of Ceselli, Umbria, told Reuters. Television stations showed images of rubble-strewn streets in a number of towns. The facades of some old stone buildings had collapsed, leaving the inside rooms exposed. Residents of Rome, some 170 km (105 miles) from the epicentre, were woken by the quake, which rattled furniture and swayed lights in most of central Italy. There were 17 reported aftershocks in the three hours following the initial quake, the strongest measuring 5.5, the Italian seismic office said. It measured the original quake at 6.0. 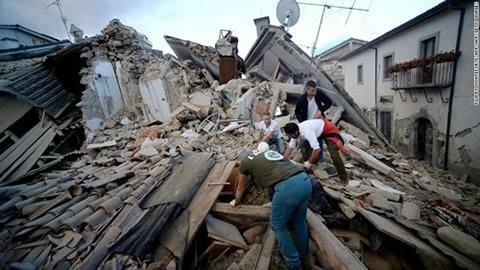 The last major earthquake to hit Italy struck the central city of L'Aquila in 2009, killing more than 300 people. 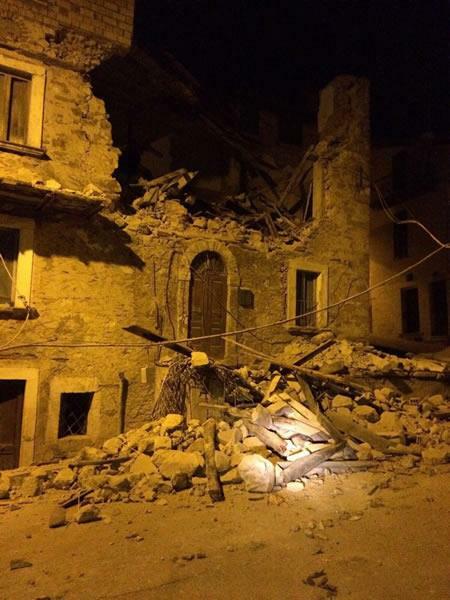 Reuters, 24 Aug. 2016- ACCUMOLI, ITALY- A strong earthquake brought down buildings in mountainous central Italy early on Wednesday, trapping residents and sending others fleeing into the streets, with at least 10 people believed killed. The quake caused serious damage to a number of towns and villages, but did not seem to have hit heavily populated areas. The worst affected towns were believed to be Accumoli, Amatrice, Posta and Arquata del Tronto. "Now that daylight has come, we see that the situation is even more dreadful than we feared with buildings collapsed, people trapped under the rubble and no sound of life," said Accumoli mayor Stefano Petrucci. RAI quoted police as saying two people were known to have died in the nearby village of Pescara del Tronto. Two bodies were removed from the debris in the small town of Amatrice. "Three quarters of the town is not there anymore," Amatrice mayor Sergio Pirozzi told RAI. "The aim now is to save as many lives as possible. There are voices under the rubble, we have to save the people there." A Reuters reporter said the town's hospital had been badly damaged by the quake, with patients moved into the streets. 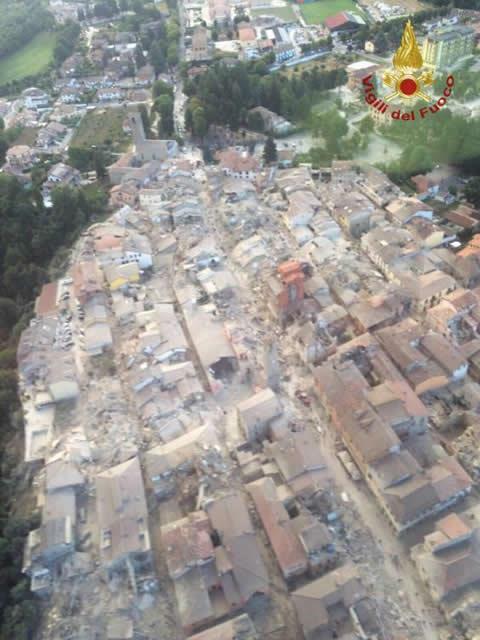 The earthquake caused damage to towns in three regions - Umbria, Lazio and Marche. 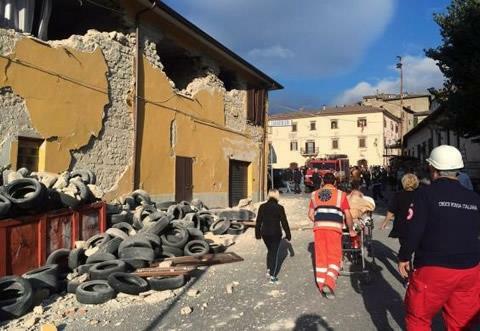 The U.S. Geological Survey, which measured the quake at 6.2 magnitude, said it struck near the Umbrian city of Norcia, which has a picturesque historic centre and is a major tourist site. Mayor Nicola Alemanno said no deaths had been reported in Norcia. "The anti-seismic structures of the town have held. There is damage to the historic heritage and buildings, but we do not have any serious injuries," he told RAI. "It was so strong. It seemed the bed was walking across the room by itself with us on it," Lina Mercantini of Ceselli, Umbria, told Reuters. The Italian earthquake institute (INGV) reported 60 aftershocks in the four hours following the initial quake, the strongest measuring 5.5. It measured the original quake at 6.0. BBC News- 24 Aug. 2016- A magnitude 6.2 earthquake has struck central Italy, leaving at least six people dead and others trapped under rubble, Italian officials said. The quake hit at 03:36 (01:36 GMT), 76 km (47 miles) southeast of the city of Perugia, at the very shallow depth of 10km (six miles), the USGS said. The mayor of one town told Italian radio that "half the town is gone". In Rome, some buildings shook for 20 seconds, according to La Repubblica newspaper. 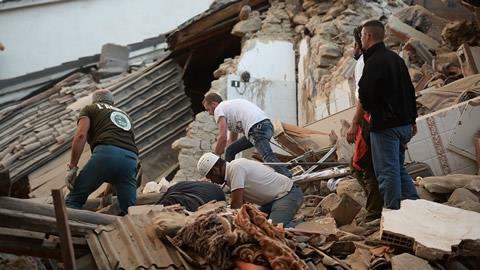 A family of four had been found under rubble in the town of Accumoli, the town's mayor Stefano Petrucci told RAI TV. Meanwhile police said two people had died in the nearby village of Pescara del Tronto, RAI reported. 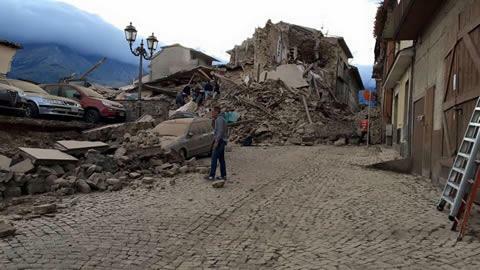 There were also reports of serious damage in the town of Amatrice. "The roads in and out of town are cut off. Half the town is gone. There are people under the rubble... There's been a landslide and a bridge might collapse," mayor Sergio Perozzi told RAI radio. 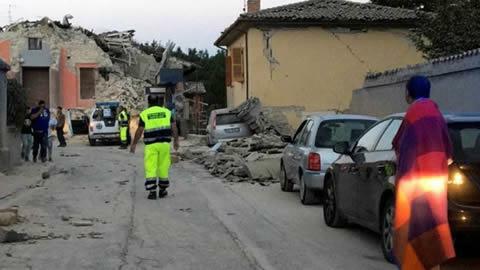 Italy's Civil Protection agency described the earthquake as "severe". The quake was initially reported as being magnitude 6.4. 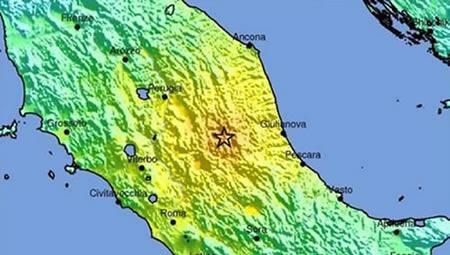 It was followed by several powerful aftershocks, La Repubblica newspaper reported. "It was so strong. It seemed the bed was walking across the room by itself with us on it," Lina Mercantini of Ceselli in Umbria, told Reuters news agency. The USGS predicted the damage could be significant, based on data from previous quakes. In 2009, a 6.3-magnitude earthquake in the Aquila region, which was also felt in the Italian capital, left more than 300 dead. Agencies, 24 Aug. 2016- AT LEAST two people are dead and many more are reportedly trapped under rubble after a powerful earthquake brought buildings crashing down and made one city “disappear” in central Italy. The shallow, 6.2-magnitude quake struck 10km southeast of Norcia, a town in the province of Perugia in southeastern Umbria in the early hours of Wednesday morning, according to the United States Geological Survey. The quake was felt as far away as Rome, about 150km away from the epicentre, as homes in the historic centre swayed about 3.30am local time. 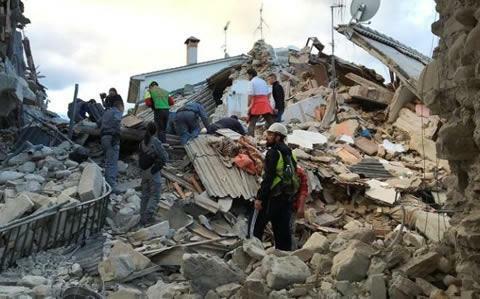 Police have confirmed that an elderly couple was killed in the disaster after their home collapsed at Pescara del Tronto in the Marche region. 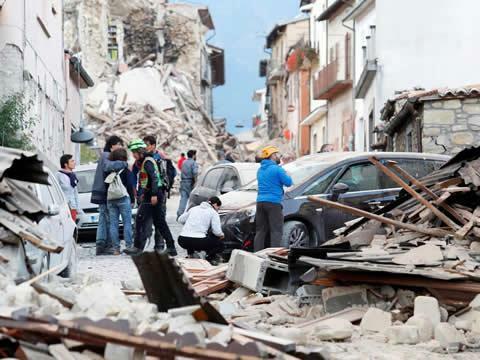 Witnesses told Italian media that many buildings had collapsed in villages close to the epicentre of the quake near the town of Norcia in the region of Umbria. People reportedly ran into streets in central Umbria and Le Marche, according to state-run RAI radio. 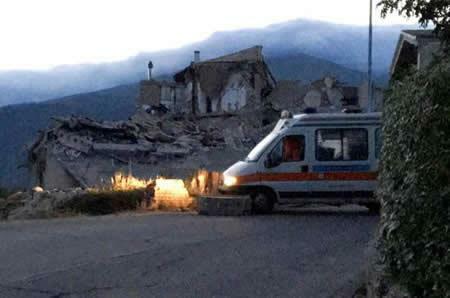 There are reports the city of Amatrice, near the epicentre, was “destroyed” and that “half of the city disappeared”. Amatrice is a mountain village in neighbouring Lazio, with a population of less than 3000 people, that was packed with visitors at the peak of the summer season. Amatrice mayor Sergio Pirozzi said the quake was a “tragedy” and that some of his 3000 constituents are trapped under the rubble. The Repubblica newspaper reported that at least one bridge had collapsed, making access for emergency services difficult. “The access roads to the town are isolated,” the mayor said. “I’ve issued an appeal to free up the roads. Half the village is no more, we have people buried under the rubble. I fear they are dead. We have room for rescue helicopters but the priority is to clear the streets. We are working without lights”. Widespread damage and several collapsed buildings have been reported in the town of 5000 people. “The town doesn’t exist anymore,” Mr Pirozzi said. “The ancient doors have come down. We need help from the civic protection. “Apparently houses have collapsed now, but I am not there yet so can’t confirm,” he said. Social media users have taken to Twitter to post photos of the devastation. USGS’s PAGER system, which predicts the impact of earthquakes, has issued a red alert — suggesting significant casualties and damage based on previous quake data. A 2009, 6.3-magnitude earthquake in the Aquila region, about 90km south of the latest quake, which was also felt in the Italian capital, left more than 300 dead. The spokesman for the Italian fire department, Luca Cari, said they had received reports of buildings being damaged, but had no further details. “It was the worst (quake) of my life” Matteo Berlenga told Reuters after leaving his house near Gubbio in the central Italian region of Umbria when the earthquake struck. Prime Minister Matteo Renzi’s spokesman said on Twitter that the government was in touch with the country’s civil protection agency. Italy’s Red Cross is reporting that at least one bridge into the mountaneous area is on the point of collapse. A resident of the Rieti region, which is between Rome and the epicentre of the quake, told the Rainews24 channel that she and most of her neighbours had come out onto the street after feeling “very strong shaking”. Reuters- 24 Aug. 2016-A strong earthquake brought down buildings in central Italy early on Wednesday, trapping residents and sending others fleeing into the streets, with at least six people believed killed. The worst hit towns were believed to be Accumoli, Amatrice, Posta and Arquata del Tronto, Fire Department spokesman Luca Cari told Reuters, adding that helicopters would be sent up at first light to assess the damage. "Four people are under the rubble, but they are not showing any sign of life. Two parents and two children," Mayor Stefano Petrucci told RAI television. 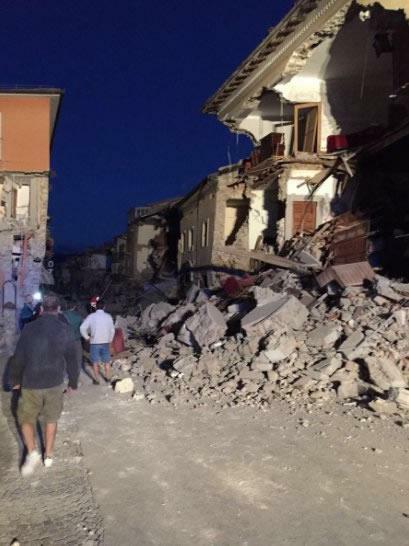 The mayor of the small town of Amatrice reported extensive damage. "Half the town is gone," Sergio Pirozzi told RAI. "There are people under the rubble... There's been a landslide and a bridge might collapse." The U.S. Geological Survey said a 6.2 magnitude quake hit near the town of Norcia, in the region of Umbria, at 3.36 a.m. (0136 GMT). Italy's civil protection agency said the earthquake was "severe". A 5.5 magnitude aftershock hit the same region an hour after the initial quake. Prime Minister Matteo Renzi's spokesman said on Twitter that the government was in touch with the civil protection agency and following the situation closely.